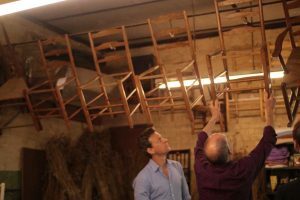 Lawrence Neal has spent his life making rush seated chairs, a trade he learned from his father Neville, who in turn learned from Edward Gardiner. Gardiner had learned from the famous architect and designer Ernest Gimson who had was taught by country chairmaker Philip Clissett. 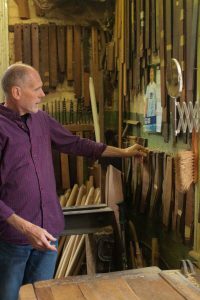 Lawrence is now approaching retirement and is looking to pass on his skills, knowledge and tools many of which were originally owned by Gimson. 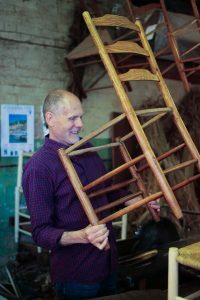 Heritage Crafts Association supporter Hugo Burge has taken a personal interest in Lawrence’s chairs and is going to fund the training process for Lawrence to pass his skills on. 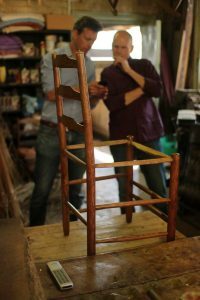 Not only that but once the successful new chairmakers are trained he can provide a workshop and subsidised accommodation on the Marchmont Estate in Scotland… all-in-all a once in a lifetime opportunity for the right person. “I fell in love with the Ernest Gimson’s Bedales Library and its chairs over 20 years ago when I bought six Bedales chairs from Lawrence Neal in 1994. Much more recently, I have been working with Lawrence Neal, who continues to make rush seated chairs today in a 100 year tradition from Ernest Gimson, still using Gimson’s tools. We are now looking for two individuals to learn from Lawrence directly (as apprentices), in Stockton, Warwickshire for one to two years, before moving the whole workshop up to Marchmont House stables in Berwickshire to let Lawrence retire and take the business forwards within a charitable structure. If you think this may suit you, download the application form here (deadline for applications 31 March 2018).